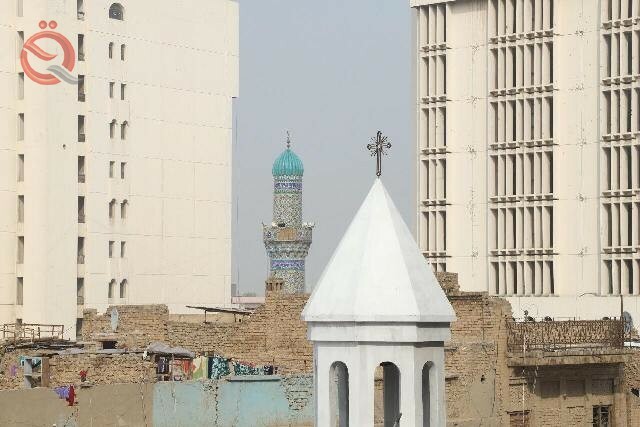 The head of the Association of Iraqi Private Banks Wadih al-Hanalal announced on Friday the rehabilitation of the Church of the Virgin Mary, the oldest church in the capital Baghdad in cooperation with the Central Bank of Iraq and the fund for community initiatives Tamkeen. "The Central Bank of Iraq and the Association of Iraqi Private Banks decided to rehabilitate the Church of the Virgin Mary in the area of ​​central Baghdad," said the head of the Association Wadih al-Hanalal, in a press statement received "The Economist News" a copy of it, noting that "the Central Bank and the Association of Banks support projects Which serve the beautiful Iraqi mosaics without looking at the sectarian or national background. " "The church, which was established in 1693 AD, suffers today after 380 years of erosion in its urban structure, so it is our moral and humanitarian duty to rehabilitate it according to the global architectural methods," he added. In the Church through the use of high-quality materials. " He pointed out that "the work is currently underway in the church 24 hours and will be the first opening of the church at the end of this month and the presence of figures representing the spectrum of Iraqi society." "The Central Bank and the Association of Banks have decided to play a prominent role in supporting Iraqi society through community, cultural and humanitarian initiatives, including the restoration of the houses of God represented by the 400-year-old Virgin Mary Church," the statement quoted Central Bank spokesman Bassem Abdulhadi as saying. , Pointing out that "the central bank is very keen to preserve the heritage of Baghdad." While the Director General of the Department of Christian affairs praised the agency in the Office of Endowments, Chairman of the Committee charged with overseeing the Church by the Armenian community, Karpit Manaskan Arminak, the efforts of the Central Bank of Iraq and the Association of Iraqi private banks to rehabilitate the Church of the Virgin Mary. "We thank the initiative of the Central Bank and the Association of Iraqi Private Banks to rehabilitate the church, which represents a surprise to us by paying attention to the heritage of heritage," Arminak said, adding that "all measures to rehabilitate the church were done without any complexity."